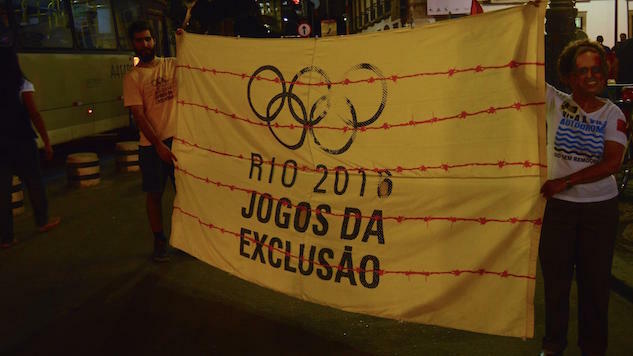 Meg Healy Protestors hold a banner reading “Rio 2016: the Exclusion Games." Meg Healy Protestors sit on the steps of the State Legislative Assembly in Rio de Janeiro. Meg Healy Protestors march to Praça Mauá. Meg Healy Inalva Mendes, 70, addresses the crowd. “I am here to represent the workers and favela residents who feel excluded by these Games,” she said. Vila Autódromo is a community adjacent to the Olympic Park that was forcibly removed for the Olympics. Of the original 600 families, only 20 remain in the community. Meg Healy A woman waves the Brazilian flag during the protest. Hundreds of people gathered in downtown Rio on Tuesday to protest what they described as the “Olympic Calamity.” Standing on the steps of the State Assembly, demonstrators decried government spending on Olympic infrastructure amid deteriorating public services. Representatives from various social movements discussed the high toll hosting the Games has cost average residents, arguing that the State’s recent austerity measures have dramatically weakened security, healthcare and education while the Olympics continue to receive emergency funding from the Federal government. Participants described delayed paychecks for public employees, overcrowded public hospitals that have resorted to turning away patients and the increasing violence throughout the city. The event reflected the animosity with which many Rio residents regard the upcoming Olympics given the political and economic turmoil at the State and Federal level. A central theme of the event was the desperate state of public education in Rio, with professors from public universities and high schools on strike to protest the recent 27 percent cut to the State’s education budget. One student at the Federal Fluminense University described how bathrooms had not been cleaned in months after the janitorial staff was laid off. The crowd continually chanted, “there’s no money for education, but there’s still money for the Olympics” during the protest. Dozens of high school students, many of whom kept their faces covered by bandanas and Guy Fawkes masks, protested the State’s disinvestment in their education. They are among the hundreds of students currently occupying public high schools to protest budget cuts, overcrowded classrooms and deteriorating infrastructure. Demonstrators described the upcoming Olympics as “the Games of Exclusion,” pointing to the experiences of the tens of thousands of residents forcibly removed from their homes to accommodate Olympic infrastructure. Inalva Mendes Brito, 70, of Vila Autódromo addressed the crowd, saying, “I am here to represent the workers and favela residents who feel excluded by these Games.” The government and local media, she claimed, had led residents to believe the Olympics would be good for Rio. “What we really need is for our fundamental rights to be affirmed. We need housing, basic sanitation, education, quality transportation. We don’t need these Games,” she said.